Here in South Daytona, Dr. Bannan is committed to lifelong learning and staying up-to-date with the latest developments in the ever-evolving dental field. As a result, Water’s Edge Dental features a wide variety of state-of-the-art tools and modern techniques that help improve patient experiences in numerous ways! From your initial checkup to your finished smile results, we hope that the speed, comfort, and efficiency of your care exceeds expectations. Any questions? Ready to schedule an appointment? Please contact our practice today. TMJ disorder is a serious oral health problem that can result in chronic and even debilitating facial pain over time. Thankfully, our team can lend a helping hand in restoring harmony to your smile, and we offer multiple therapy options so that we can determine that one that best fits your needs. If the thought of attending a dental appointment makes you feel nervous or fearful, rest assured that you’re certainly not alone. 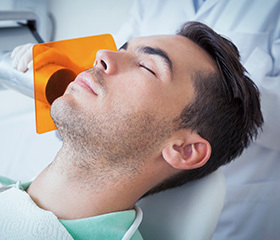 At Water’s Edge Dental, we strive to help every patient feel genuinely at ease when they visit, and our calming sedation dentistry techniques can go a long way towards easing your nerves. Our digital imaging technology can give patients a sneak peek at what their smile will look like after various cosmetic procedures! All we need is a current photo of you with your teeth showing, and Dr. Bannan can alter the image to reveal the beautiful improvements of porcelain veneers, teeth whitening, and more. We enjoy helping our patients feel 100% confident about undergoing treatment with our team here in South Daytona. Intraoral cameras are not only a valuable diagnostic tool for our team, but an excellent educational tool for our patients as well. 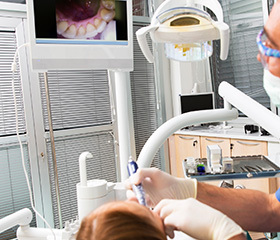 During your regular checkups, we can insert a camera-tipped wand into your mouth and start transmitting images right away to a TV screen in the room so that you can see exactly what’s going on with your oral health. Dr. Bannan can clearly point any areas of damage and even explain the effects of certain treatment options so that you can feel confident about your upcoming care. Lasers are quickly becoming the future of dentistry, and we’re happy to utilize them here in South Daytona for the benefit of our patients. 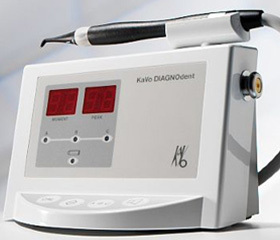 Our soft tissue laser is able to precisely and comfortably treat the gums while minimizing bleeding, swelling, and other post-operative symptoms. You can look forward to an accelerated recovery period following treatment as well, and the laser will even encourage the growth of new, healthy tissue in the area. 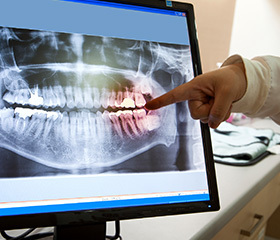 Instead of traditional film, Water’s Edge Dental now uses 100% digital X-rays! Why? 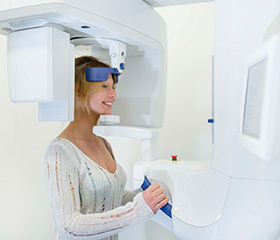 Because with this modern approach, patients will no longer have to worry about tedious darkroom development, slow transfers, or significant radiation exposure. The highly detailed images are captured and instantly available for viewing on our computer system, and they can be transferred to insurance companies and/or other medical offices in a fast, stress-free fashion. Their digital nature is also better for the environment, requiring no bulky storage. Cavities are one of the most common oral health problems that patients will experience over the course of their lives, and Dr. Bannan strives to discover and treat them as early as possible. That’s why we use DIAGNOdent! 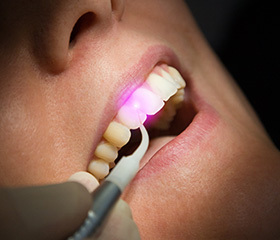 This technology captures a baseline wavelength of healthy teeth and then compares it to the wavelength created while passing a laser over your unique smile. Any variations, even small ones located in hard-to-see areas, will be represented in the findings. This means that patients can undergo earlier treatment and maintain more healthy tooth structure over time. While digital X-rays are an excellent diagnostic tool, they still leave a little something to be desired when it comes to comprehensive imaging. At Water’s Edge Dental, Dr. Bannan wants to ensure that there are no surprises when performing specialty treatment like dental implant placement, which is why he regularly utilizes revolutionary 3D Cone Beam technology. 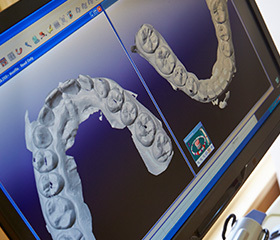 Now, our team can create three-dimensional, panoramic images of our patients’ smiles and related facial structures as well, mapping out even the smallest details like nerves. With this level of accuracy, we can maximize success and safety!